Last month I attended a conference in London and met up with a few cross stitching friends. As always we spoke about who had the newest Kreinik threads, and the newest tools. However as I sat there I realised, time after time, no one ever got their scissors out. 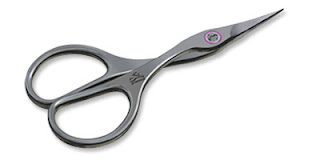 Now whilst there isn't any new scissor technology out there, when I started asking about my friend's they all complained of painful handles, hard to use, or going blunt. However, with a wealth of cross stitch and embroidery scissor types out there, there is no reason to have that old worn out blunt pair in your kit. Today, we're going to talk about scissors. 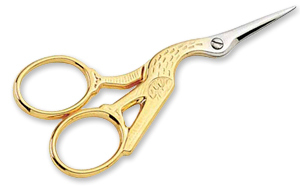 No embroidery scissors post would be complete without at least mentioning the gold stork. These are the most likely to be in your kit, however their shape isn't actually meant to for use. Back in the 16th century scissors in England were classed as decorative items, and those who owned golden stalk scissors would NEVER pick them up. AS a result, they aren't that good to stitch in. 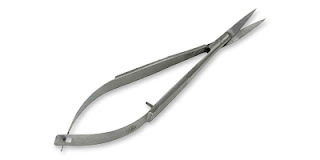 You may also have a pair of straight, non decorative scissors in your kit. However these Premax painted embroidery scissors combine both worlds, giving you a very usable pair that's also super decorative. But like many pairs of scissors, sometimes the average just isn't working for you. These scissors however try to address all the issues you might have. Stainless steel construct means they don't go blunt, the large finger holes mean they're easy to grip, and their ringlock system means you never have to tighten them. The most common problem though, by far is getting to grip with the scissors themselves. No finger holes ever seem to work correctly, and don't get me started with left and right pairs. Weaver's scissors were the modern alternative. 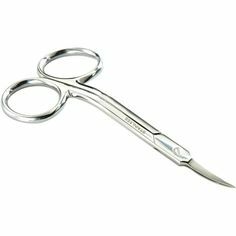 In reality these were the style of the first scissors, easy to grip on the sides, with a small sharp edge, which can be easily changed if required. Whilst they're great to hold however, they can be a little hard to control, meaning you might chop something you didn't mean to. So Premax came up with an alternative. A slightly thinner, lighter pair work by using negative force. They also contain a curved blade to allow better control. They're made from stainless steel too, so won't go blunt, and due to their design won't need tightening. Of every pair I tried in the course of making this post, these definitely seemed like the most advanced, clearly crafted just for this purpose. At first I didn't really get it, why would a pair specifically made for sewing machines help me? But then I tried them. They allow you to snip threads in a cross stitch frame like a dream, and they just work so well with the curved blades. 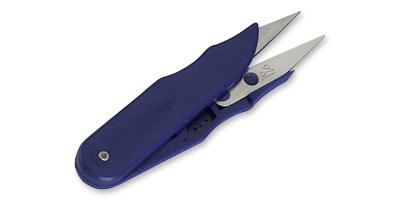 Sure, they'll need tightening, and they aren't the easiest pair to get your head around initially, but maybe sometimes you should try something a little out of the box, because these scissors are a dream. Feel like you're in a rut, like you need to jump-start your creativity? Or maybe you just want to stretch your imagination, zone out from daily stresses, and make something colorful with your hands? Perhaps you're looking for a summer Saturday activity for friends, mom-and-me, a club or community group. If so, we have great news! We are adding creative, fun classes to our First Saturdays at the Kreinik Factory Outlet Store in Parkersburg, West Virginia. The store is open from 10 am to 2 pm the first Saturday of every month (unless noted, like here). Now you can add playtime to the day, have a chance to experiment with Kreinik threads, try new materials, and make something useful or give as a gift. The next class is June 3. Read on for details. 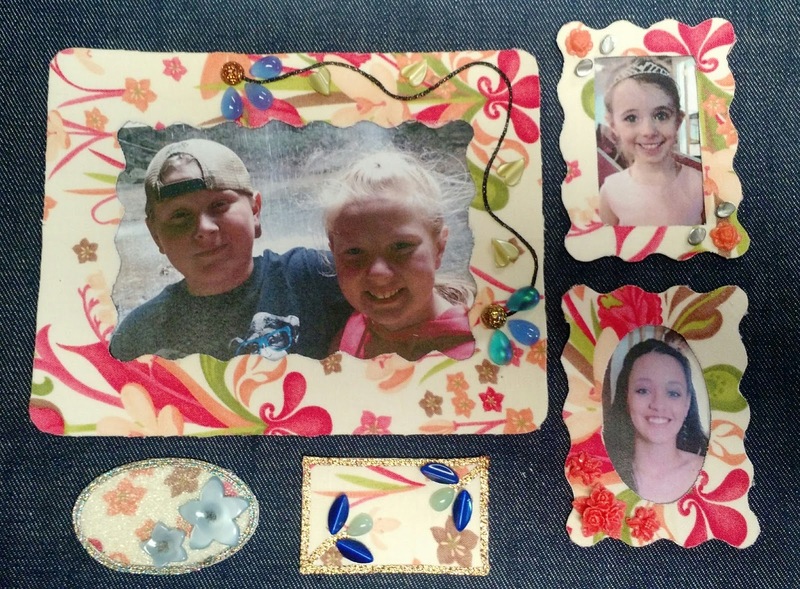 Create magnetic photo frames using fabric, tape, iron-on thread and other embellishments. A variety of fabrics and embellishments will be available to create your own unique frames—one-of-a-kind, just like you. Class is limited to 10 students. Sign up to reserve your spot. You will learn how to apply iron-on threads and hot-fix crystals. You will also learn how to use Treasure Tape and glass beads to create a unique look. Are you up for a Cross Stitch Adventure? 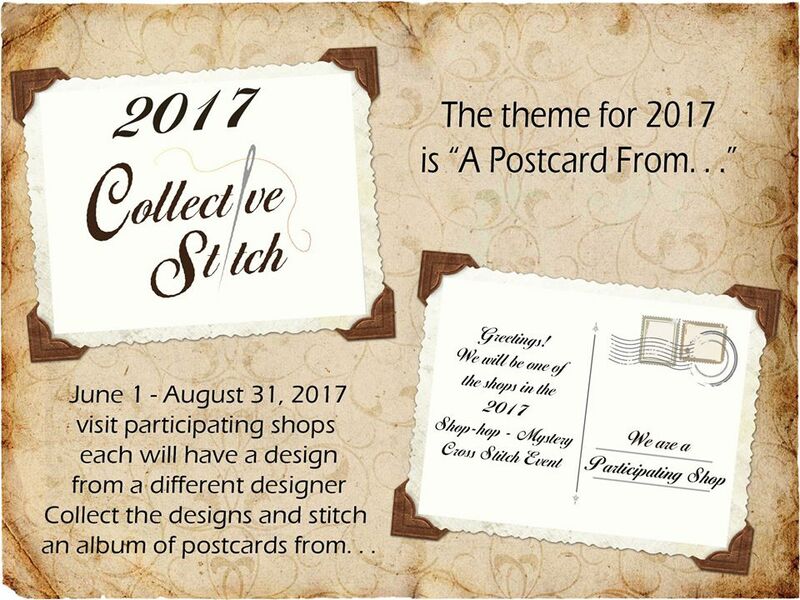 We are a stop on this year's Collective Stitch Shop Hop! 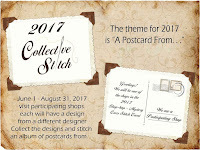 It is a cross stitch project combined with a shop-hop, treasure hunt, and mystery stitch along. Participating shops will each have a chart designed by a different designer. Visit the shops, collect the charts, and stitch them all together to create an amazing, unique project. 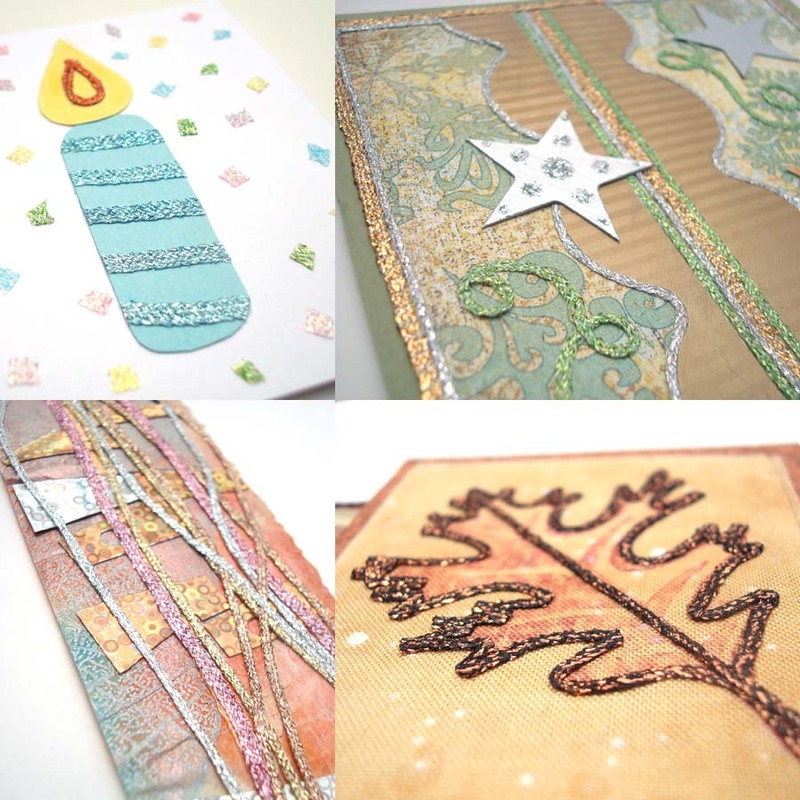 Kreinik's special design is by Angela Pullen Atherton and features Kreinik silk and metallic threads (of course!). The shop hop runs June 1 through August 31, 2017. So make your shopping lists, gather your friends, and get ready to visit some terrific needlework stores. Details on the shop hop here. We know it's not your usual hot destination spot—Parkersburg, West Virginia, that is—but it is home to the Kreinik thread factory. Find it on the map and make your way to 1708 Gihon Road tomorrow through Saturday, May 10-13, for "wild and wonderful" outlet store sale. 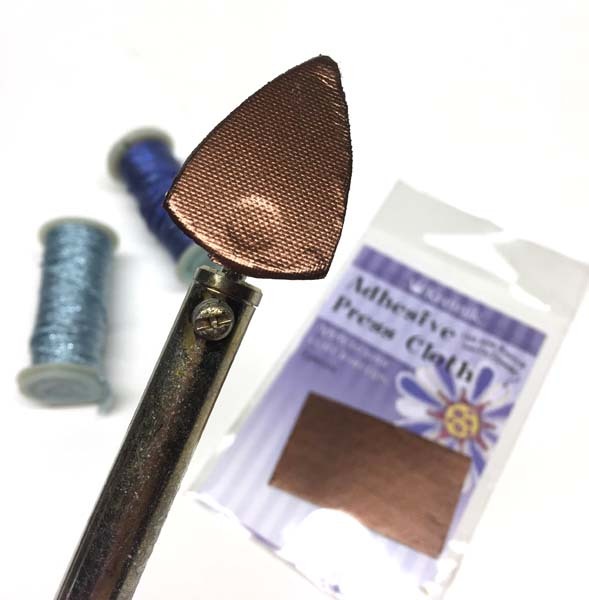 We have metallic thread, silk thread, even some cotton thread, plus fabrics, accessories, and all kinds of fun, creative supplies. It's a big Kreinik yard sale, meaning you get great deals on materials you can use in any creative technique. 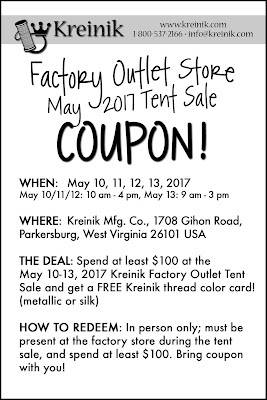 As a special bonus, bring a copy of this coupon (spend $100 and get a free color card). This offer applies in person only; no online, mail order or phone-in orders. May 10, 10 a.m. to 4 p.m.
May 11, 10 a.m. to 4 p.m.
May 12, 10 a.m. to 4 p.m.
May 13, 9 a.m. to 3 p.m.
What about the rest of 2017? This week we open our parking lot to visitors from everywhere for one of two big sales events this year. Our store is generally open Monday through Friday, 10 a.m. to 4 p.m., and the first Saturday of each month. Open times may vary due to circumstances, however, so it's always best to call ahead: 1-800-537-2166 or email info@kreinik.com. NOVEMBER: Open Saturday November 4, plus our normal weekday hours. Closed November 23 and 24 for Thanksgiving holiday. DECEMBER: Open Saturday, December 2, plus our normal week day hours. Closed December 25-January 1 for holiday break. 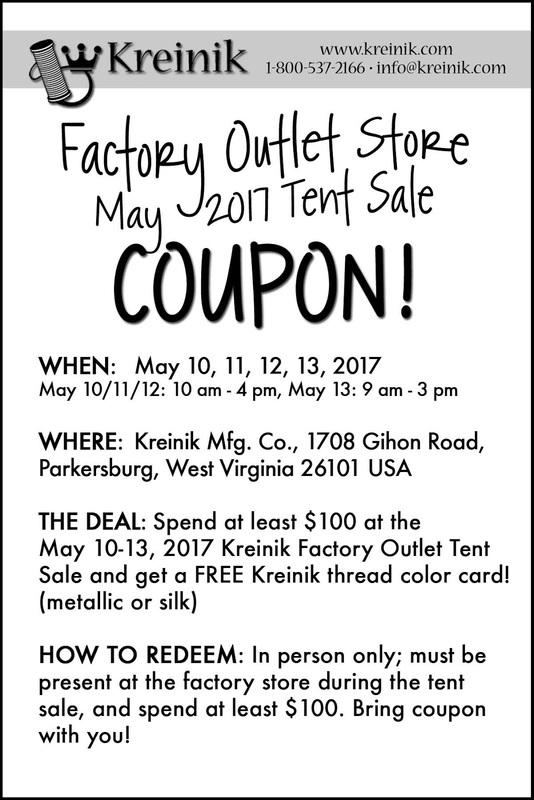 The Kreinik Factory Outlet Store is one of the stops on the 2017 Collective Stitch Cross Stitch Event, a shop hop running June 1 through August 31. For all the fun details, visit www.facebook.com/collectivestitch. 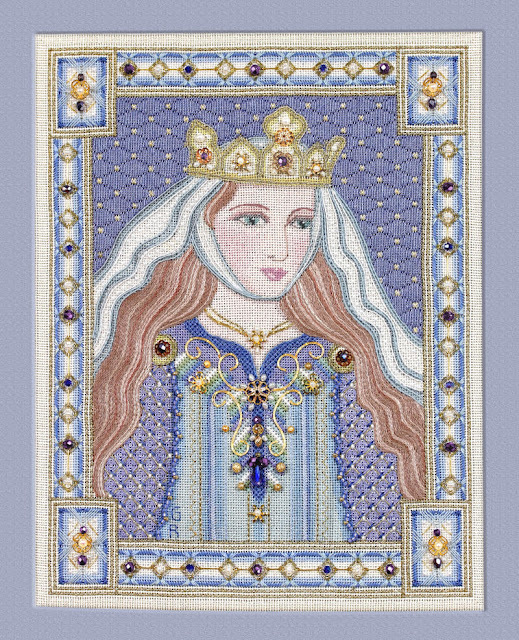 One of the most talented and popular needlepoint designers of our time, Gay Ann Rogers, brings history to life once again with her new pattern, Eleanor of Aquitaine. Released May 1, 2017, Eleanor is a needlepoint portrait of one of the most famous and powerful queens of the Medieval period. The creation is stunning when stitched—it sparkles majestically with Kreinik metallic threads. Imagine how stunning this would look in your home, a library, or a school. We asked Gay Ann a few questions about Eleanor, the third design in her queen series. Read more to discover why this piece is so special, then click on the link at the end to purchase the pattern/kit while supplies last (each of the previous queen kits sold out quickly). QUESTION: What inspired the new design? GAY ANN: After I stitched portraits of Elizabeth 1 and Catherine the Great, I decided to continue stitching history’s powerful women, and Eleanor of Aquitaine, the most powerful of Medieval queens, seemed a natural choice. Eleanor, the heiress in her own right to one of the largest Duchies in Europe, was married to the king of France, then the king of England and she was the mother of three kings, young Henry, Richard the Lion-Hearted and John Lackland who gave England Magna Carta. Eleanor’s court was renowned for troubadours, courtly love and the legends of Camelot. I stitched Eleanor of Aquitaine in honor of Judy Souliotis, my fellow needlework teacher and friend who had stitched Elizabeth 1 and was in the middle of stitching Catherine when we unexpectedly lost her. In my last conversation with Judy, she asked me which queen was next and she said ‘just be sure she has lots of gold and many jewels. My husband, who is a retired history professor, guided many of my choices. It was his suggestion that I use Medieval Books of Hours as inspiration for colors and patterns. Because of the profusion of gold and the jewel-like patterns in illuminated manuscripts, it wasn’t difficult to fulfill Judy’s requests. 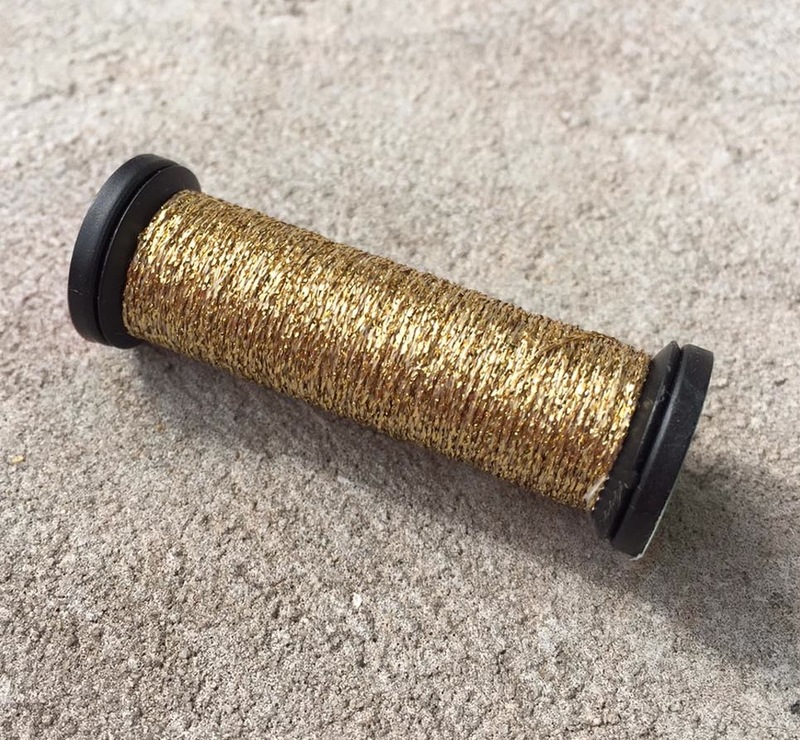 QUESTION: Which Kreinik threads are used, and how are they used? GAY ANN: I like to work in layers and if you look carefully, you will see that Kreinik braid is integrated into almost every appropriate pattern on Eleanor of Aquitaine: outlining her crown, surrounding her jewels, creating a part of her necklace, throughout her dress and cape, providing the sparkle in the background and structuring the frame. For Eleanor I used gold Kreinik braid in two sizes, #4 and #8. Because I work so often on congress cloth and like light-weight threads for delicacy, my go-to weights of Kreinik braid are often size #4 and size #8. I find Kreinik braids lift my designs with a bit of sparkle and texture. Juxtaposed with the smoothness of silk, the texture possibilities of adding Kreinik braid are wonderful. In fact, I cannot remember the last design I stitched without Kreinik braid and my portrait of Eleanor is no exception. Kreinik braid has long been a staple of my stitching threads and I have used the gold color #002 on each of my queens. QUESTION: How do you select stitches and threads to give a design dimension? 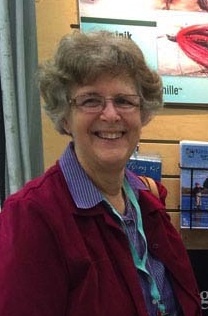 GAY ANN: Years ago, when I stitched a landscape, I discovered a technique that has become the foundation of each of my portraits. I often stitch an undercoat of Diagonal Tent Stitch the way a painter washes color on a canvas, then I stitch patterns on top of the Diagonal Tent Stitch. As I almost always use a very light weight of thread, the colors of the top layers mix with the colors of the Diagonal Tent Stitch undercoat for small but interesting shifts in color. It has become one of my favorite ways of mixing colors. By using separate layers of very light-weight threads, I also find that the patterns preserve a delicacy not possible with heavier threads. Here’s a good example: if I stitch the background first in Diagonal Tent Stitch, I can use a single ply of silk on top of the Diagonal Tent Stitch instead of the much bulkier two or three ply it would take to cover the canvas. As a result, the background does what it should do: it recedes and showcases the focal points of the design rather than dominating them. I use beads and pearls in so many designs and I try to use layers to build up to them, so that their height flows well with the flatter stitched parts of the design, for gentle hills and valleys. This is an important way I use Kreinik braid: I build small layers around or near beads and pearls that stair step up to the height of the beads. In my design of Eleanor, the outlines around her crown are a good example: the outlines are relatively heavy and therefore they stand up off the canvas and integrate well with the height of the jewels. I almost always use layers in stitching a project. I begin with a low and often thin layer and then gradually build on the layer to achieve a quiet dimension. It is currently my favorite way to stitch. Yes, it can be tedious and time-consuming at times, but I love the effects. QUESTION: Where can stitchers get the pattern and kit? Eleanor will be for sale throughout May for as long as I have remaining kits; Eleanor’s class at Shining Needle Society will begin on June 1. I look forward to the class. Among the goals of the class: to remove some of the intimidation about faces: I don’t have a formula for making faces, but I do use some simple techniques over and over again. I always think the best way to create a face in needlepoint is the simplest way. Don’t say too much. Another goal of the class is to encourage stitchers to experiment a bit and make their Eleanors their own fantasies. There is such a fine line between history and fantasy, particularly for Eleanor of Aquitaine. The only known ‘portrait’ of this most famous Medieval queen, is a sculpture of her, so it leaves a wide berth of possibilities for individual fantasies. One of the charms of needlepoint is that it allows people to add favorite touches to their work. Too often people are too frightened to try and part of the purpose of my class is to take away some of the fright. There is always a great feeling of reward when someone’s work stands out in a personal way. QUESTION: Any hints as to what's coming next? GAY ANN: Next I plan to stitch two samplers derived from a traditional English sampler I bought a couple of years ago. I don’t plan to reproduce the sampler; I want to play with the designs so that the samplers I stitch relate to the historic one and draw inspiration from it, but equally reflect the era in which I stitch. No sooner do people hear about one queen than they begin asking about the next one. Will there be another? Maybe. I find queens are industrious undertakings and I need some breathing time between them. That said, I can think of another possibility, maybe even two, so maybe. We’ll see what time brings.